Jaguar made a sensational decision in producing the XKR-S Coupe and they have decided it’s time to expand the impressive line-up with the addition of a new Convertible model. 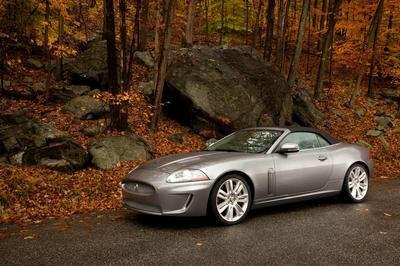 The new XKR-S Convertible made its world debut at the 2011 Los Angeles Auto Show and is the most powerful and fastest open-topped GT Jaguar has ever built. 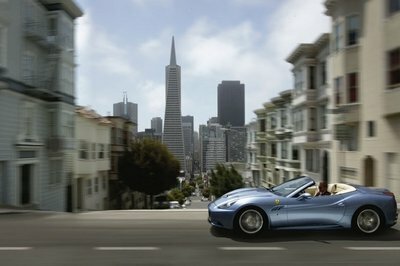 The convertible uses the same 5.0-liter supercharged AJ-V8 engine as the coupe version. It delivers a total of 543 HP and a peak torque of 502 lbs-ft; enough power to sprint the car from 0 to 60 mph in 4.2 seconds on its way up to a top speed of 186 mph. 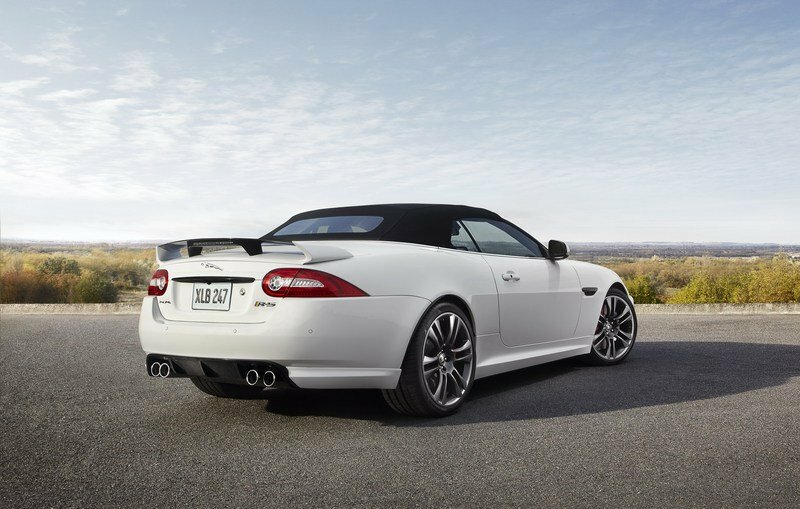 Just like the coupe version, the XKR-S Convertible received an impressive aerodynamic package that helps maintain stability in an open-topped car capable of speeds as high as 186mph. More than that, all the exterior changes make the XKR-S look more aggressive and sportier than ever. Adrian Hallmark, Jaguar Global Brand Director says, "There is nothing as liberating as life behind the wheel of an open-topped Jaguar and the new XKR-S Convertible takes the Jaguar GT experience to new heights." UPDATE 02/02/2012: Jaguar has unveiled a new video showing the XKR-S Convertible as it plays in the snow somewhere in Finland. Enjoy! More details on the 2012 Jaguar XKR-S after the jump. The most important part of designing the Jaguar XKR-S Convertible was prepping the aerodynamics to appropriately deal with the vehicle’s 186 mph top speed. The Jaguar underwent extensive computational fluid dynamics, wind tunnel, and track work to make all of the needed changes. This resulted in a new bumper design which incorporates a wider, lower air intake, a carbon fiber splitter, and twin side nacelles. There are also new sills which serve to both smooth the horizontal airflow and emphasize the 10mm reduction in ride height. The rear has received a unique rear wing with a carbon fiber inlay and a new rear apron featuring a carbon fiber diffuser. All of these changes helped in reducing the overall lift by about 26% and balanced aerodynamics in the front and rear for added stability. After the aerodynamics were where Jaguar needed them to be, the sports car was then treated to a gloss black paint job (available as standard) and a dark technical finish of the lightweight, forged 20" Vulcan design alloy wheels. All told, the XKR-S Convertible will be available in six optional colors, including Polaris White and British Racing Green, a tribute to Jaguar’s competition heritage. The standard black and six other optional colors are also transferable to the convertible’s hood, which opens and stows in just 18 seconds and has been proven at the car’s maximum speed. Once the hood is comfortably stowed, the luxurious and sporty interior is bared for all to see. It comes with carbon-leather trimmed versions of Jaguar’s Performance seats with integrated head rests, racing harness cut-outs, and increased side and squab support to hold driver and passenger securely during high speed cornering. The comfort level is increased with the 16-way adjustable, heated seats featuring carbon leather highlights and contrast micro-piping only found on this particular model. Jaguar has also added a multifunction three-spoke leather-wrapped steering wheel and Jaguar-embossed bright stainless steel pedals. The center console is finished in gloss black and contrasts with the standard, but exclusive dark aluminum finish. A Piano Black finish is also available as an option. 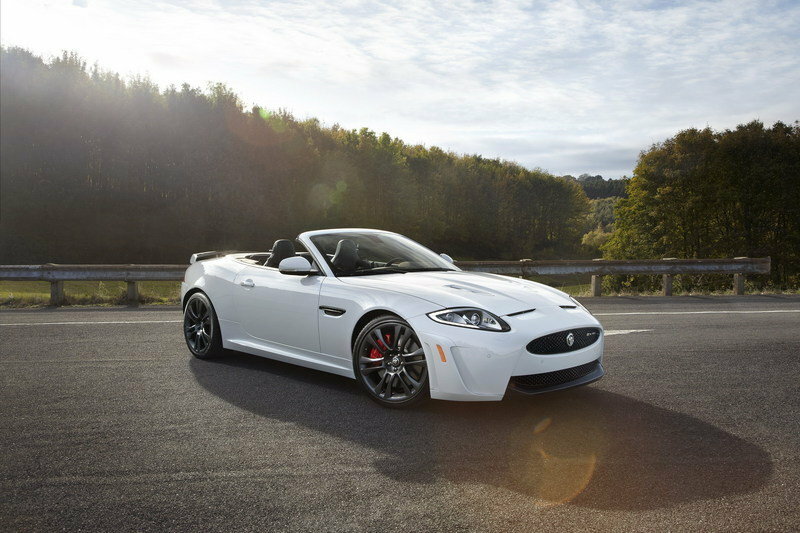 The XKR-S Convertible is powered by the same 5.0-liter supercharged AJ-V8 engine found in the Coupe model. This engine incorporates spray-guided direct injection and variable valve timing for great efficiency as well as prodigious power. It delivers a total of 543 HP and 502 lb-ft of torque, an 8 percent increase in power and 9 percent increase in torque when compared to the Jaguar XKR. When combined with the six-speed automatic gearbox with Active Differential, this RWD sports car can go from 0 to 60 mph in 4.2 seconds on its way up to an electronically limited top speed of 186 mph. The engine is combined with an active exhaust system for that deep and throaty exhaust note, but is handled by revised front and rear suspensions, including a redesigned aluminum front steering knuckle and revised rear geometry, as well as stiffer springs and dampers. These elements are joined by forged alloy wheels - which also offer greater traction and grip levels - a Dynamic Stability Control system, and a High Performance Braking System. 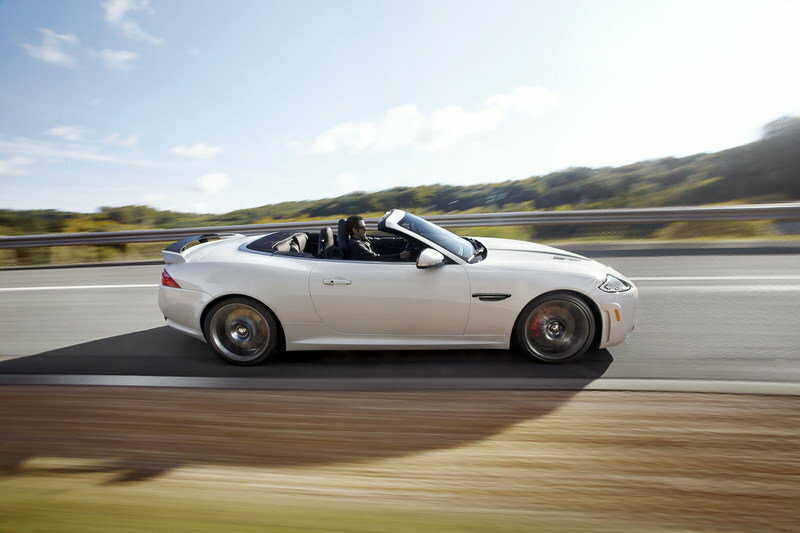 The new Jaguar XKR-S Convertible went on sale in early 2012. During its official debut at the Los Angeles Auto Show, Jaguar announced that the North American market will get a total of 25 units of the XKR-S Convertible. With a starting price of $138,875, this would be a dream car for any true sports car fan out there. But there’s a catch: all the 25 units have reportedly been sold in advance of the car’s debut. It was hard enough to find a proper competitor for the XKR-S Coupe when it was unveiled, so we’ll stick with the same formula for the Convertible. The Jaguar XKR-S Coupe was appropriately matched up with the BMW M6 Coupe, leaving the XKR-S Convertible to do its own thing with the M6 Convertible. 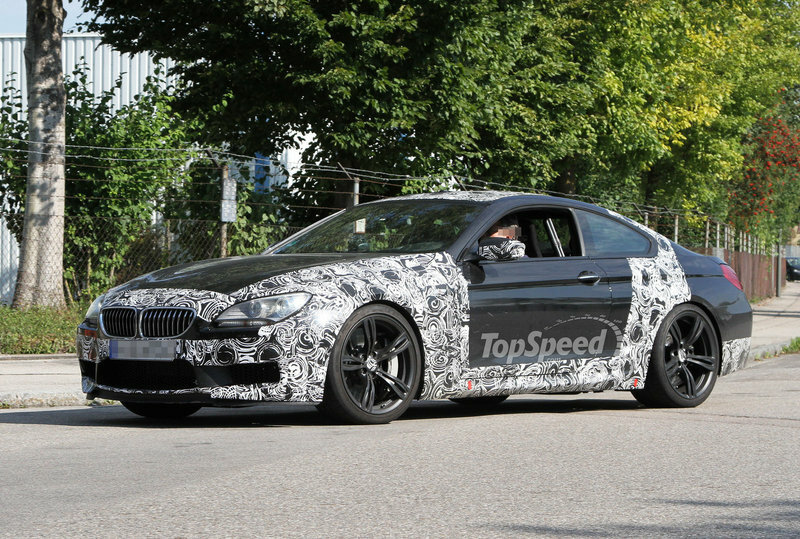 Rumors state that the new M6 will use a twin-turbo 4.4-liter V-8 engine with an increased output of up 600 HP. Clearly, the M6 Convertible has the hand with power, but only if the engine rumors are true. For right now. we’ll stick with the facts. This is sweet! 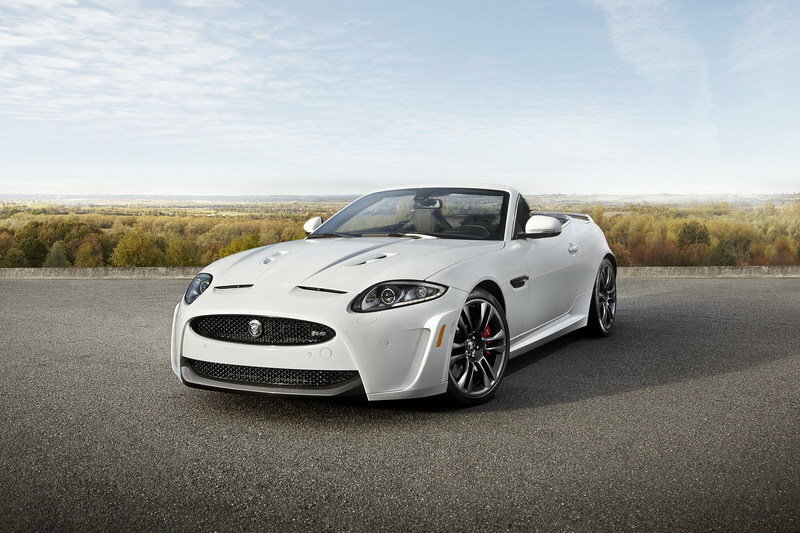 XKR-S Convertible is said to be the Jaguar’s most powerful and fastest open-topped GT? This thought could surely drive a car-lover insane! I’m sure that this one is really fun to drive. I really like the sleek design of this convertible, the rims are a perfect match to the body kit, and I like the hood style. This is said to be Jaguar’s most powerful and fastest open-topped GT. The performance is as good as the design of its exterior. This convertible car looks more aggressive and sportier. The concept design is very cool to look at. From the body paint up to it’s wheels, I find it more impressive and stylish. When it comes to speed performance, this boost up the high speed stability. this car Looks great on both interior and exterior.this car seems very high-end and competitive. I bet this car would sell like hotcakes once released in the market. its simple but luxurious design makes it very attractive. This Jaguar XKR-S is the most powerful and fastest open-topped GT of Jaguar. I’m so impressed on its super classy interior. Its aggressive and but looks so comfortable. I’m amazed by its speed, truly exceptional! its nice that they tried to design a convertible version of this car, its looks fun to drive. I’m bothered by the fact that they will only release 25 units, it will surely affects the pricing for sure. 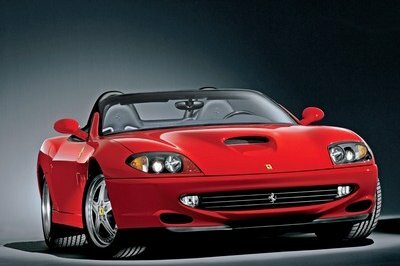 so elegant convertible car, well-designed and styled. From the rear wheel to the exterior front. 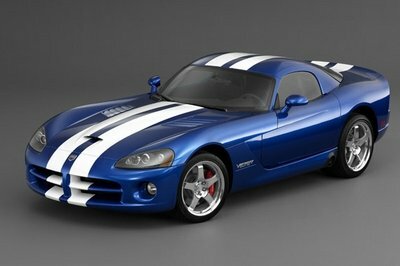 This has an advantage and able to compete to other sports luxury car. I’m impressed with the sporty looks of this XKR-S convertible, the hotness of the color that this car had is very stunning, and I think the V8 engine is quite good for it. Its aggressive and looks so comfortable. I’m amazed by its speed, truly exceptional! its nice that they tried to design a convertible version of this car, its looks fun to drive. I’m bothered by the fact that they will only release 25 units, it will surely affects the pricing for sure. If Jaguar showed this Convertible XKR-S in Geneva, it definitely be a big news for everyone. It’s been a long time since they’ve made a type like that. I am not really all that surprised that they will be bringing in a convertible version for the XKR-S. I already saw it coming when they first launched the car. I think I would probably prefer the regular version over the convertible. I was not really that much a fan of such a designed, since I like standard cars more. Well, I think I would probably prefer the regular version over the convertible. I was not really that much a fan of such a designed, since I like standard cars more. I noticed that it looks more aggressive on its air intakes on its front hood. Moreover, I’m already impressed on its maximum speed. 186 mph is really quite remarkable for a convertible vehicle. This convertible version of the XKR-S is really so cool! I also love the angst and aggressiveness of this, which is very noticeable on it and its engine output is absolutely awesome for this. The video only proves that this convertible is really an awesome vehicle and so fun to drive with! I also love the fact that they increased the comfort level on its interior, which is truly great for it. Well, I think this one will be too pricey on its market production. Anyway, its so sad to know that it would be limited only to 25 units. Well, this one will surely be one of their biggest successes. Jaguar is really great with a simple looking vehicle but oozing with an appeal and have a luxurious interior and this XKR-S had the quality! I’m so impressed either with its power train, which is great for this car. For a convertible vehicle, the engine that it had is I think already too dangerous on it. However, for a fan of a powerful vehicle, it only gives them an idea that this Jaguar is so fun to drive with!